Welcome to our #AskExcelinEd series on the National Summit on Education Reform (#EIE18)! Follow along for sneak peeks at the can’t-miss conversations we have planned for #EIE18 taking place in Washington, D.C., on December 5-7. 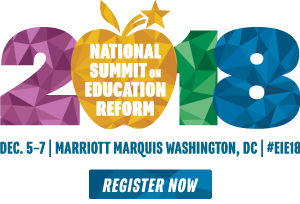 Today, Liya Amelga, ExcelinEd’s Associate Director of K-12 Reform, highlights two strategy sessions covering how states are rising to the challenge of school turnaround and ways to integrate social emotional learning into K-12 education. Enjoy! ExcelinEd is an organization focused on the state’s role in K-12 education, and our #EIE18 strategy sessions will help identify how state policymakers and education leaders can advance student-centered reform. But in some instances, the lion’s share of reform work will be done by schools and districts. In these cases, the states’ chief role is to create the conditions necessary for success at that local level. Several of this year’s strategy sessions cover the importance of this role and outline the different approaches states can take to fulfill it successfully. I’m particularly excited about two of these sessions: Rising to the Challenge of School Turnaround and Integrating Social Emotional Learning & Academic Development. The education world has spent the past few years discussing Every Student Succeeds Act (ESSA) state plans. Now, states are shifting their attentions to implementation. This has left us in education policy all wondering: How will states go about implementing their plans? States have outlined—both within and outside of their ESSA plans—different approaches to intervening in schools in need of the most support. In the strategy session Rising to the Challenge of School Turnaround, a panel moderated by Chiefs for Change CEO Mike Magee will dive into the strategies three states are implementing to improve their struggling schools. These strategies include leveraging choice, federal funds and effective instructional resources. The session Integrating Social Emotional Learning & Academic Development will cover one of the most important factors, in my opinion, for ensuring positive student outcomes: the integration of social emotional development into how students learn in school. Social emotional development names those behaviors and attitudes we often unconsciously recognize as necessary for success in all aspects of life. Students who hone social emotional skills—such as critical thinking, collaboration, persistence and communication—often have the best outcomes in school and later in their careers. In the K-12 education world, there is a push for schools to be intentional and deliberate about embracing social emotional learning to develop well-rounded individuals who are prepared for college, career and civic engagement. The business sector also has a significant interest in ensuring graduates have acquired these skills, because the students of today are the workforce of tomorrow. I look forward to hearing from this session’s expert panel, including members from the Collaborative for Academic, Social and Emotional Learning (CASEL) and the Aspen Institute’s National Commission on Social Emotional and Academic Development. Join us for the latest findings and recommendations surrounding the integration of social and emotional learning into the academic framework of K-12 education! Keep an eye on our #EIE18 Agenda in the coming weeks for complete details on panelists and sessions. See you in Washington, D.C., in December!